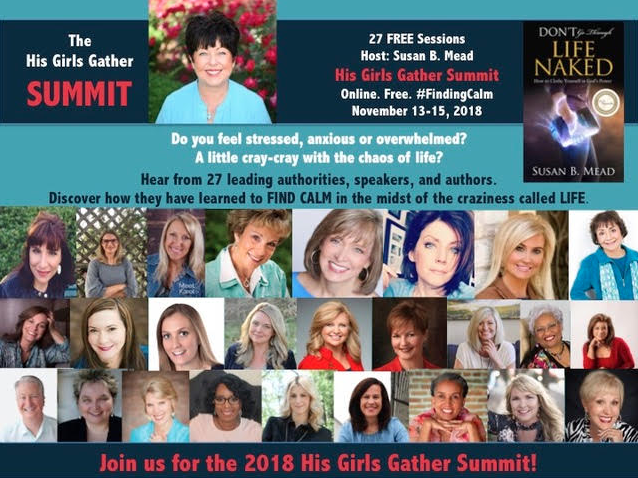 You have been such faithful supporters of Shannon Ethridge Ministries that I want to gift you with an invitation to a FREE online event, The His Girls Gather Summit! Join me as 27 well-loved and respected Christian experts, including me, (many are bestselling authors) share their stories and biblical truths regarding Finding Calm in the chaos of life. The event goes live Tuesday, November 13 – Thursday, November 15, yet it is viewable beyond these dates. Sign up today for your FREE gift below! Learn from experts how to seek the peace that passes understanding when your world turns upside down. Whether you are stressed, anxious, or overwhelmed – oh, my, the list is endless! · Garner an arsenal of weapons to enrich and empower your walk with God. · Discover how to find calm in the midst of the craziness called life. · Grow to believe Jesus really can and does speak to our storms – peace, be still – and nature obeys. All the 27 General Sessions are FREE. In addition to this, you can upgrade your pass to get both the Audio MP3 files and a handful of bonus videos. You can dig in deeper to gather strategies, timely tactics, and practical wisdom on how to proceed. You may want to watch the videos as often as you like over the next 6 months or download the audio files to listen anytime, anywhere. What are you waiting for? Grab your FREE ticket today. And, if you can’t attend Tuesday, November 13 – Thursday, November 15, we’ve got you covered. Get the All Access Pass and you’ll be able to watch the videos and download the audios post-event.